Fifteen years ago, Art Byrne suggested to me that the title of our book about The Wiremold Company’s Lean transformation should be Lean Strategy. I resisted that suggestion because I did not view Lean as a corporate strategy, despite Art’s firm belief that it is. Who was right, me or Art? Based on that definition, Lean seems to be a strategy (click here for other definitions). However, because the usual context for Lean pertains to corporations, we must understand what is corporate strategy (also referred to as “strategic management“). This is more complicated. As you dig further, you quickly find that “strategic management” is akin to “leadership” in that they both can be defined in myriad of different ways. “Strategy” and “strategic management” can mean almost anything that a corporate leader or book author wants it to mean. Click here and here to learn more. So, Lean may seem to be a strategy, but that could merely be the result of confusing strategy (long-term) with execution (short-term). Does Toyota consider TPS and The Toyota Way their corporate strategy? You would think that being the creators of TPS and The Toyota Way that they would. But they do not. If they do not, why should anyone else consider TPS and The Toyota Way (or Lean) a corporate strategy? 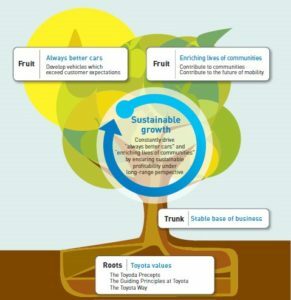 Click here, here (click on “Learn about the Tree”), here, and here (see pages 11-13) to read about Toyota’s strategy. TPS and The Toyota Way are how Toyota people think and do things, but it is not Toyota’s corporate strategy. A strategy articulates what an organization must do in order to succeed against the competition. Take a company that makes buggy whips in the automobile era. The buggy whip company leaders’ understanding and execution of Lean could be flawless, but the company will obviously fail because the strategy does not recognize the external environment in which it competes. If the corporate strategy is sound, then Lean can help an organization achieve its strategy. But Lean, itself, is not a strategy. You can see a clear separation between strategy (the “what”) and execution (the “how”). That is how Toyota leaders have long seen it. I agreed with Mark then, and that remains my view today despite the sometimes ambiguous nature of strategy. And don’t forget, Taiichi Ohno’s book Toyota Seisan Hoshiki, translates as “Toyota Production Method,” not as “Toyota Production Strategy.” “Method,” in the industrial engineering sense of the word, is not a strategy. Nevertheless, there is a long history in progressive management of authors using book titles and sub-titles to gain the attention of top company leaders. They use words such as “strategy,” “wealth creation,” “sustainable growth,” “cost savings,” “higher profits,” “competitive advantage,” “innovation,” and so on, are explicit in their attempt to capture a particular audience. These words are like a siren call to CEOs. In Greek mythology, Sirens were attractive creatures who made enticing sounds that lured sailors to their demise. The book over-promises and under-delivers. The path to success articulated in the book is too complicated, detailed, or nuanced for the most CEOs understand and to put into daily practice. The path to success articulated in the book is incomplete and missing key details and ignores likely pitfalls; focuses on the upside while ignoring downsides. Leaders (or their delegates) misunderstand the book and transform its ideas and practices into something different and therefore less useful or less impactful, often resulting in negative unintended consequences. Think about this: If you carefully follow what corporate leaders do, you find that the most common corporate strategy is to acquire businesses or lines of business, for the purposes of growth, gaining market share and, especially, pricing power (i.e. gain leverage over customers). Corporate strategy is usually devised to position the company to face less competition in order to increase profits. In other words, create sellers’ markets for your goods and services. Reducing competition, by whatever means, has the added benefit of making management’s job much easier. So there is a tension here: TPS and The Toyota Way (or Lean) is a management practice for competitive buyers’ markets and is unnecessary for non-competitive sellers’ markets. 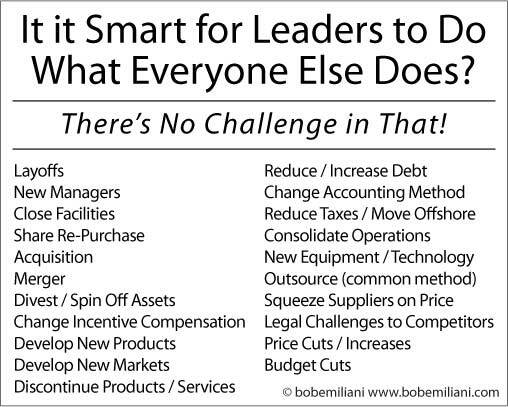 If the corporate strategy is to gain leverage and control the marketplace, then most leaders would say they have no need for Lean. If they do decide there is a need for Lean, then it is seen simplistically as just another tool to increase profits or as one means that can be applied along with other means to achieve the strategy. The corporate strategy does not say anything about TPS or Lean. It could be achieved using a combination of well-worn methods, none of which are associated with TPS or Lean. Lean is not specifically mentioned in Wiremold’s corporate strategy. Visual controls and 5Cs (same as 5Ss) could be applied as two tools independent of Lean, while the origins of Quality Function Deployment do not lie with TPS. The reality is that Lean is one of many methods that leaders could use to achieve Wiremold’s corporate strategy. You and I may view Lean as a better method compared to all others, but most CEOs would not. They would use methods that they are more familiar with. And don’t lose sight of the fact that Lean is not identified with corporate strategy in either top- or bottom-tier MBA degree programs. Let’s be honest: Of all the methods that CEOs can choose from to increase corporate value, improve financial performance, create competitive advantage, innovate, achieve sustainable growth, and so on, Lean is by far the most difficult for them to understand and correctly execute. And TPS+Toyota Way is an order of magnitude (or two) more difficult than Lean. That is an irrefutable fact. In conclusion, should I have followed Art’s suggestion to title our book Lean Strategy? No. But if you believe Lean is a corporate strategy, as Art does, then carefully compare that to kaizen and the image above to figure out which is the better corporate strategy. Thought you might be interested in another POV regarding exactly what constitutes “Strategic Management” and – by this “alternate” definition – find out how closely it relates to the application of TRUE LEAN thinking principles and practices (ala the TPS/Toyota Way); not to mention Art Byrne’s preference for using the word “strategy” in the title of the book in question. Strategic Management is the management of an organization’s RESOURCES (i.e., financial/economic, physical, human, intellectual/knowledge-based, etc.) to achieve its goals and objectives. Strategic management involves setting objectives, analyzing the competitive environment, analyzing the internal organization, evaluating strategies and ensuring that management rolls out the strategies across the organization. AT ITS HEART, strategic management involves identifying how the organization stacks up compared to its competitors and RECOGNIZING OPPORTUNITIES AND THREATS FACING THE ORGANIZATION, Whether they come from within the organization or from competitors. Strategic management is divided into SEVERAL SCHOOLS OF THOUGHT. A PRESCRIPTIVE APPROACH to strategic management outlines WHAT (i.e., providing a CONTEXT for taking action) strategies should be developed, while a DESCRIPTIVE APPROACH focuses on HOW (i.e., providing the CONTENT for taking action) strategies should be put into practice. These schools differ over whether strategies are developed through an analytic process in which all threats and opportunities are accounted for, or are more like general guiding principles to be applied. [Note: Ideally speaking both the PRESCRIPTIVE AND DESCRIPTIVE APPROACHES are combined together into a single, holistic approach… not unlike what one finds/encounters in the HOSHIN KANRI strategic planning and policy/practice deployment framework. While an organization’s upper management is ultimately responsible for its strategy, the strategies themselves are often sparked by actions and ideas from lower-level managers and employees. [Note: A very good description of what took place within Wiremold, as described in the book.] An organization may have several employees devoted to strategy rather than relying on the chief executive officer (CEO) for guidance. Because of this reality, organization leaders focus on learning from past strategies and examining the environment at large. [Note: Art, as Wiremold’s CEO, had a very close and strong working relationship with both Jean E. Cunningham and Orest J. Fiume, both of who play key roles in fostering the necessary lean thinking and behaving throughout Wiremold.] The collective knowledge is then used to develop future strategies and to guide the behavior of employees to ensure that the entire organization is moving forward. For these reasons, effective strategic management requires both an inward and outward perspective. MAKING COMPANIES ABLE TO COMPETE is the purpose of strategic management. To that end, PUTTING STRATEGIC MANAGEMENT PLANS INTO ACTION is the most important aspect of the planning itself. Plans in practice involve identifying benchmarks, realigning resources – financial and human – and putting leadership resources in place to oversee the creation, sale, and deployment of products and services. Strategic management extends to internal and external communication practices as well as tracking to ensure that the company meets goals as defined in its strategic management plan. For example, a for-profit technical college wishes to increase enrollment of new students and graduation of enrolled students over the next three years. The purpose is to make the college known as the best buy for a student’s money among five for-profit technical colleges in the region, with a goal of increasing revenue. In this case, strategic management means ensuring that the school has funds to create high-tech classrooms and hire the most qualified instructors. The college also invests in marketing and recruitment and implements student retention strategies. The college’s leadership assesses whether its goals have been achieved on a periodic basis. Hope these insights are helpful to the readership. Strategy originally is a military term, for the plans on where you deploy armies and fleets and for what purposes. It is supplemented by tactics, the methods used in the field to engage the enemy. It is easy to think of it as cascading down, where what is tactics to the general is strategy to the colonel, and so on down to the grunt, who only has tactics. I agree with you that, to the CEO, Lean is not a strategy but a tactic. To the VP of Manufacturing, on the other hand, it is a strategy. In 1993 an article was published in a journal: Here we Go Again, Will TQM Go the Way of QWL. Quality of worklife not Lean is known Asia, Africa and even Europe. What business and healthcare organizations are using and academics write about. The reality of Lean in the bubble that it exists in in America is that it is only a academic and consultant construct.